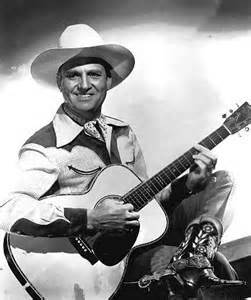 Gene Autry gained fame as a singing cowboy, when his career began in the 1930s. He was born Orvon Grover Autry on September 29, 1907 in north Texas. He would work on his father’s ranch while he was still in school. After leaving school, his talents singing and playing the guitar led to the opportunity to perform at local dances. An encounter with Will Rogers, he was encouraged to pursue his dream of singing professionally. He got his start by performing on various radio shows in the late 1920s and early 1930s, including National Barn Dance. In 1929, he signed a contract with Columbia Records. In the early days he recorded a number of styles and genres. His first hit was a duet with Jimmy Long, “That Silver Haired Daddy of Mine,” which both of the men co-wrote. In 1932, he married Ina May Spivey. After being discovered by producer, Nat Levine, Autry made his film debut in the 1934, In Old Santa Fe, as part of a quartet of singing cowboys. The next year he appeared in the starring role of the 12 part serial, The Phantom Empire. Before the end of the decade, he appeared in another 44 films, all B Westerns, appearing with his horse Champion. Autry was the first of the singing cowboys, but soon followed by others such as, Roy Rogers. He was the first to carry country music to a national audience. “Back in the Saddle Again” became his signature song. He briefly suspended his career to serve in World War II. From 1942-1945, he served in the US Army. He transferred his private pilot’s license to a service pilot rating during his military career. Upon return from the war and finishing out his contracts, he formed his own production company. 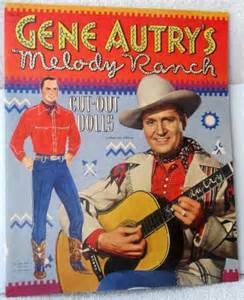 From 1940-1956, he had a weekly radio show, Gene Autry’s Melody Ranch. In response to his listeners, he developed the Ten Cowboy Commandments, which are listed below. By the 1950s, he had moved his weekly show to the new medium of television. He also developed and promoted his own western-theme merchandise line. In 1953, he purchased 110 acres in the Placerita Canyon and renamed it Melody Ranch, after his movie by the same title. After selling part of the land, he maintained part of the land for sets and location shoots for upcoming movies. These stood until they were destroyed by a brushfire that swept through in August 1962. Autry sold the land in 1990, and today the Melody Ranch Museum is located there and is open year round. The property continues to be used for numerous movie sets. Autry was the founder and owner of Challenge Records, which he sold in the 1960s. In total, Autry recorded 640 songs, wrote or co-wrote over 300 songs, and sold over 100 million records. He had the first ever certified gold record. 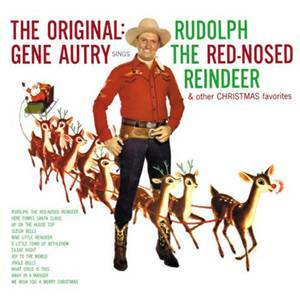 Autry retired from show business in 1964, having made almost 100 films and over 600 records. In 1969, he was elected into the Country Music Hall of Fame and the Nashville Songwriters Hall of Fame a year later. He invested wisely during his career and after retirement. This included involvement with the American League of Baseball and partial ownership of the California team, Los Angeles Angels. In 1980, his wife, Ina May Spivey, passed away. The following year he married Jacqueline Ellam. 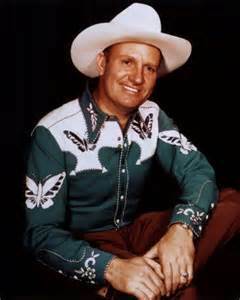 Gene Autry died of lymphoma on October 2, 1998, at the age of 91. He is buried in the Forest Lawn, Hollywood Hills Cemetery. In 2003, he was inducted into the Radio Hall of Fame.